Belinda Bagwell is the daughter of Blaine Greentown Bagwell and Bonnie Redinbaugh.1 Belinda Bagwell married Richard Sezbenski after 1960. Benita Bagwell is the daughter of Blaine Greentown Bagwell and Bonnie Redinbaugh.1 Benita Bagwell married Stan Zirkle after 1950. Beth Ann Bagwell is the daughter of Blaine Greentown Bagwell and Bonnie Redinbaugh.1 Beth Ann Bagwell married (?) Jaenicke after 1960. Bradley Bagwell is the son of Blaine Greentown Bagwell and Bonnie Redinbaugh.1 Bradley Bagwell married Patricia Ann Varnau. Bart Bagwell is the son of Blaine Greentown Bagwell and Bonnie Redinbaugh.1 Bart Bagwell married Lisa (?) after 1960. 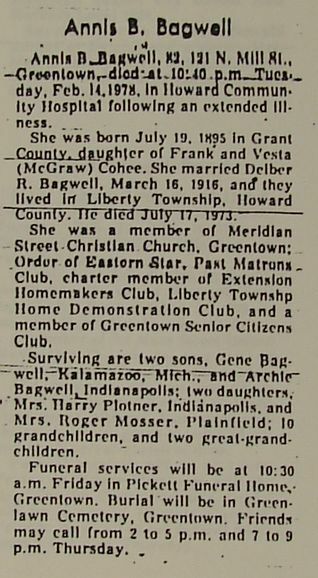 Brenda Bagwell was born on 31 May 1943.1 She was the daughter of Blaine Greentown Bagwell and Bonnie Redinbaugh.1 Brenda Bagwell died on 13 May 1944.1 She was buried on 18 May 1944 at Greenlawn, Greentown, Howard County, Indiana. Patricia Ann Varnau married Bradley Bagwell, son of Blaine Greentown Bagwell and Bonnie Redinbaugh. Emma Lee Bagwell was born on 10 April 1898 in Choudrant, Lincoln Parish, Louisiana.1,2 She was the daughter of Andrew Jackson Bagwell Jr. and Emma Harriett Gentry.1 Emma Lee Bagwell married Oliver Oscar Thompson on 22 March 1930 at Shreveport, Caddo Parish, Louisiana.1,2 As of 22 March 1930,her married name was Thompson. Emma Lee Bagwell died on 30 September 1996 in Wichita, Kansas, at age 98 Emma Lee Bagwell was born April 10, 1898 in Choudrant, Lincoln Parish, La., a small country town in the North-central part of Louisiana. She was the eighth of eleven children born to Andrew Jackson Bagwell, Jr. and Emma Harriet Gentry Bagwell. Emma Lee (she insisted on being called Emma Lee, not just Emma) grew up in Choudrant, where she played on the girls high school basketball team, became a proficient piano player and graduated from high school in 1917. Emma Lee remained in Choudrant for the next five years, where she worked as a clerk at the local drug store. She also served as the town recorder of births, since the town physician, Dr. Cook, owned the drug store. She recalled that Dr. Cook charged $13.00 for delivering a baby, including a trip to the mother's house to deliver the baby. In 1922, Emma Lee moved to Shreveport, La. 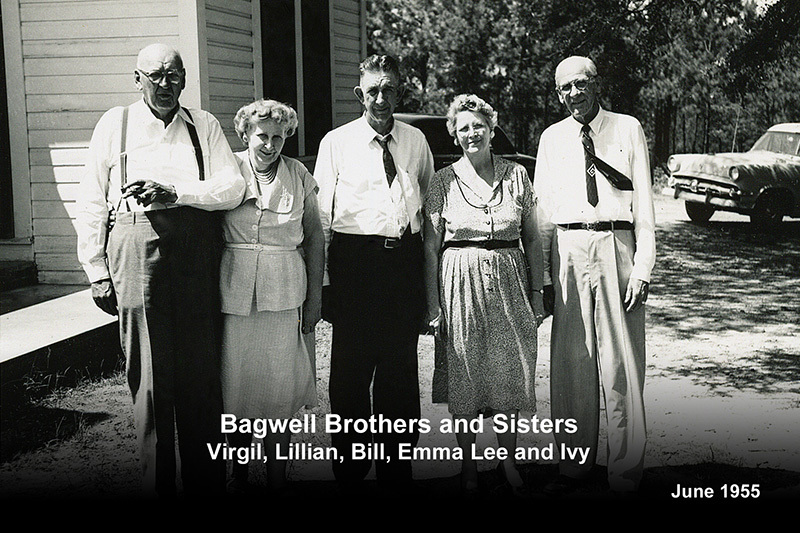 to assist her younger sister, Viola (Bagwell) Kelly, who was expecting her first baby. Emma Lee lived with Viola's family (James Kelly, husband, and their two children, James and Melrose). Emma Lee worked as a cashier at Big Chain grocery store. Tragedy struck the Kelly home in 1929. Viola became ill and died, leaving two children, James Jr., age six, and Melrose, age three. Emma Lee continued to live in the home another year to assist her brother-in-law, James, in caring for the two young children. Throughout her remaining life, Emma Lee maintained a special, close relation with James Jr. and Melrose, formed during their early years together. During this time Emma Lee met Oliver Oscar Thompson, who worked at a local lumber company. After dating for several years, Oliver and Emma Lee were married March 22, 1930 in the parsonage of the First Methodist Church of Cedar Grove, a suburb of Shreveport. They lived in Shreveport throughout their married life, until Oliver died on December 21, 1965. Oliver and Emma Lee had one son, Glenn Oliver Thompson, born Nov. 2, 1934. In 1979 Emma Lee moved to Wichita, Ks. to live near her son. Emma Lee became a Christian at an early age and was active in Southside Baptist Church in Shreveport and Sharon Baptist Church in Wichita. Many members of the Sunday School classes she taught remained close friends during her lifetime. Emma Lee was noted for her beautiful hand crafts, including hooked rugs, crocheted afghans, baby blankets and tatting. While operating a hooked rug business out of her home in Shreveport, she designed and sold hundreds of hooked rugs. Emma Lee died Sept. 30, 1996 at Wesley Hospital, Wichita, Ks. She was buried in Forest Park East Cemetery, Shreveport, La. next to her husband, Oliver, on Oct. 7, 1996.1,2 She was buried at Forest Park East Cemetery, Shreveport, Caddo Parish, Louisiana. [S866] Email from Glenn Oliver Thompson dated June 2009 to Hunter Wayne Bagwell - Subject Line: Jr. Children of Andrew Jackson Bagwell. [S1186] Email from Glenn O. Thompson dated 2/10/2010 to Hunter Wayne Bagwell; Subject Line: Emma Lee Bagwell Descendents.